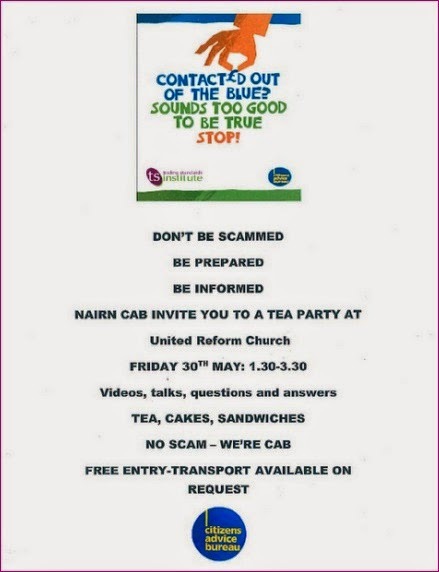 A Gurn from Nurn: Date for your Diary - Scams Awareness Tea Party - Nairn United Reform Church Friday 30th May 1.30-3.30 p.m. Date for your Diary - Scams Awareness Tea Party - Nairn United Reform Church Friday 30th May 1.30-3.30 p.m.
Nairn CAB informs the Gurn: "As part of Scams Awareness month Nairn CAB are hosting a Tea party on Friday 30th May 1.30-3.30 at the URC. We will have speakers from Trading Standards and hopefully Police Scotland at the event. Plenty home baking too!"